Let me introduce myself. :) My name is Radovan Beňo (alias silblade222 here) and I’m coming from the Czech Republic. My first experience with LOTR LCG was on Christmas 2015, where I have got my first Core set. In that day, I hadn’t any idea, how deeply and with which passion I will immerse to this card game. I had experiences with Magic the Gathering, which has learned me some useful mechanics and tactics, which afterward were familiar in LOTR LCG for me. Thanks to it, I love deckbuilding and finding proper combos and synergies, what LOTR LCG could offer me as well. The Tactic sphere is my favourite, I play solo two-handed games and my favourite activity is finding the utilization for weak, overlooked, forgotten cards, or just thinking up some original or interesting decks, which I’m therefore testing in almost every scenario. I’m also an enthusiastic reader of various reviews on cards, expansions, adventure packs etc. And because I think, there isn’t much material about deep analyzing of every card in LOTR LCG, I have started to create own reviews with own observations and experiences, which I have gained during testing various decks. The first time people open their Core Set, they generally don’t have any idea how good the cards are in that set. It is a varied bunch of cards after all, with some being used to this day in many decks, and others ending up in the binders when the players get a larger pool of cards to choose from. Players are also inclined to play the game in progression mode, meaning that they will play scenarios only with the cards that were available at the time that the scenario was released. Though this limits your cardpool, it makes for a nice challenge where you have to think outside of general power decks and come up with combos of your own. In this series, we will look at all player cards individually, only taking the cardpool into account that was available at the time. We start off with the Core Set, which will be split into 5 parts, each dealing with a different sphere of influence. These in-depth card reviews will hopefully teach new players the strengths, weaknesses, and combos of these cards. Note, that some of the reviews are enriched by spoilers, which are visibly distinguished by red background and white text. In some places, I was feeling it was necessary to mention some content from the future packs and expansions as well. However, if you don’t wish to read it, jump over these spoilers in order to progression mode preservation. Very weak and almost unusable card. It is better to avoid this card completely. Under-average card with arguable or very specific effect / ability. You can use it occasionally, better as a part of sideboard. Average card, which doesn’t hurt or strengthen your deck considerably. Include this card, if you have a free place or you lack a stronger alternative. Solid card with good effect / ability. The strength overcomes the potential weakness of this card, so you should consider free place in your deck for this card. Excellent and very useful card. You shouldn’t miss this card in your deck, because the impact on the game is great. Something like “super-card.” The impact on the game is so indisputable that it should be “auto-included” card. Heroes aren’t evaluated by this rating, because there aren’t heroes, which would be “auto-included” in your decks (no, not even Éowyn :)). Note that each section (Heroes, Allies, Events, Attachments and Summary review for the whole sphere) also has its own Final rating. It mustn’t reflect the real average value from all cards of a given section. So without further ado, let’s kick off with the first sphere: Leadership. For those that are interested in one of the particular cards, you can jump to those cards using the list below. The very first hero introduced in this game also belongs amongst the most popular character in LOTR universe. Aragorn, son of Arathorn, known as Elessar and Strider, Chieftain of Dúnedain and the heir of Isildur, Elendil’s son of Gondor – what can you offer? The answer is – a lot. But let’s begin from start nicely. 12 starting threat is maybe the worst (and probably the only one) aspect of this hero. He belongs to multifunctional heroes – questing with 2 Willpower, defending with 2 Defense + 5 Hit Points and attacking with 3 Attack makes from him a useful versatile tool against any menace from any encounter deck. Add keyword Sentinel and you know that this guy can help not only to you but also to other players. And be sure that they will need Aragorn’s services. It is also possible thanks to his response: commit him to a quest, spend 1 resource and prepare him to another action. Readying Aragorn can also be done in other ways, even in the Core Set environment. You don’t need to rely on arrival of such cards like Unexpected Courage. The ability is just present and you can use it. In practice, sometimes I am in a quandary with his ability versus save resource for other cards. At the beginning of almost every scenario, your mission is to build army step by step, increase stats by attachments and save some resources for unexpected events. If you haven’t started with combo Aragorn–Theodred, then you will often ask yourself: should I commit him to a quest and lose 1 resource, or rather save resource for paying some another card? From this point of view, Aragorn should accompany at least one another Leadership hero, who will produce Leadership resources. Otherwise, you could have a problem with producing Leadership resources and/or, on the other hand, you won’t be able to use his ability in full strength. So mighty Steward of Gondor is an attachment, which Aragorn can fully utilize, and you stop having to deal with this dilemma. 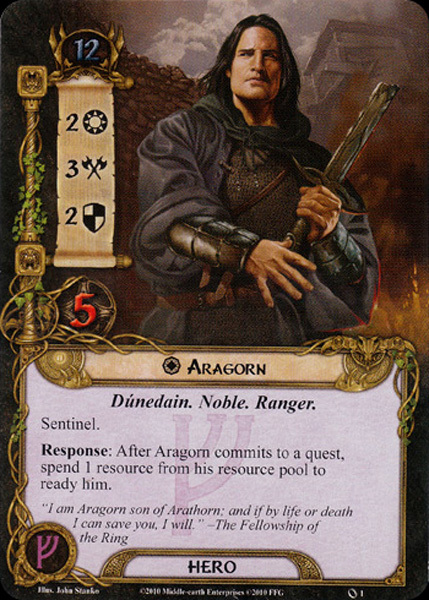 I have to mention, that Aragorn himself is one of the few heroes, for which some cards are designed. He doesn’t need to rely on traits like Dúnedain as other heroes. 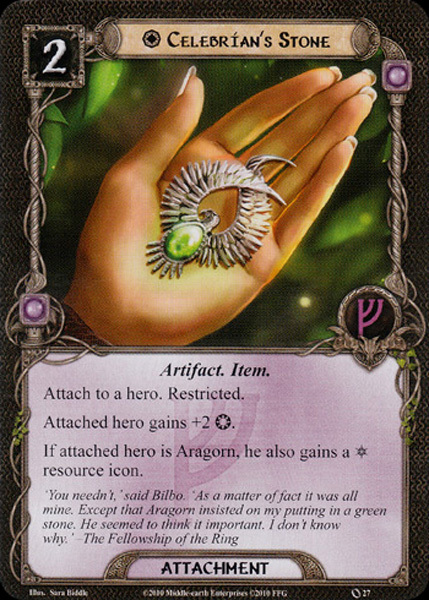 In the Core Set appears one attachment made for Aragorn, and that is Celebrían’s Stone. I like cards, where you use their full potential. Celebrían’s Stone is very useful by itself, but add it to Aragorn and you get nice bonus in form of Spirit resource icon. So let’s summarize Aragorn: in term of stats, he belongs to superior heroes. Combination 2-3-2-5 makes from him good quester, excellent attacker and cool defender. Sentinel keyword on the other hand is good message for other players, that his defending potential can be useful even for them. Thanks to his response, you gain a very flexible hero with at least two actions per round, that help you control the game with better success. However, don’t forget to ensure other supply of Leadership resources, because then you can manage playing other Leadership cards and use Aragorn’s ability as well. Théodred is first Rohan character we met in Core set. We know that Rohan characters are basically specialists in questing. This assumption let in us some doubts or even disappointment when we look at stats of Théodred. 1 Willpower is not enough for good quester. 2 Attack can hit some enemies, but we sense that attacking won’t be his primary task, same as defending with 1 Defense and 4 Hit Points. At least 8 starting threat won’t make wrinkles on our forehead. So, for what is this hero good? His response predestined Théodred for a specific task. When you commit him to a quest, you choose a hero (it concerns Théodred himself as well), who is also committed to that quest, and add 1 resource to the resource pool of that hero. Seems interesting to me and surely is, but let’s look at it closely. Good quester should have at least 2 Willpower, then we can say “yes, committing him to a quest is a good idea.” So if response predestined hero to some action, but he hasn’t got an adequate stat for it (similar to Thalin), I must ask myself, why should I keep this valuable position for 1-Willpower questing Théodred, when other heroes fit his role far better? When I commit him to a quest, I add 1 resource to any resource pool of another questing hero. Will this help me in questing itself? Hardly. 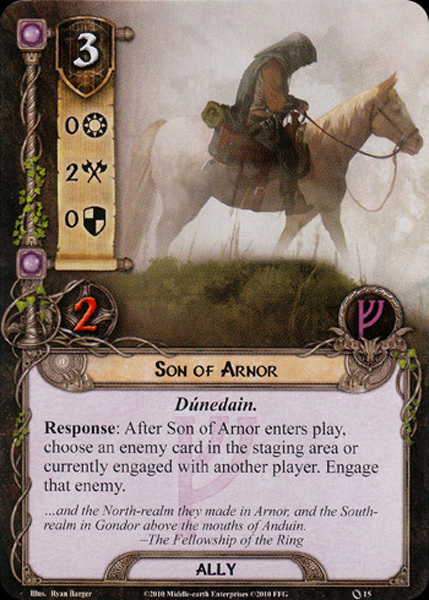 I don’t know, why designers at the beginning of LOTR LCG life held back the stats for heroes like Théodred or Thalin, whose primary task is some action but they lack proper attributes for it. It doesn’t bother me so much as with allies, where you are not limited by their numbers and benefits exceeds costs (for example Northern Tracker). However, for heroes, who should play the main role in your deck, it seems a little bit odd. Okay, I must confess that I have weakness for the last Leadership hero from Core set. 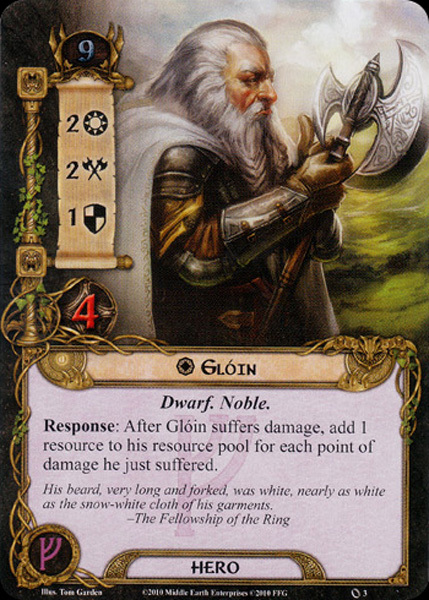 When I am building deck with Leadership hero(es) and I need some resource boosting, apart from Steward of Gondor, I pick Glóin. Before describing his amazing ability let’s see his basic stats. 9 starting threat is a good default value. 2 Willpower, 2 Attack and 1 Defense with 4 Hit Points could indicate that the main goal for this hero is supporting your questing and attacking effort. Defending would be the last thing you could maybe suppose. However, defending belongs to Glóin’s speciality thanks to his response. After he gains damage, you add 1 resource for each point of damage he just suffered to his resource pool. So without any attachments, Glóin could generate in one round 3 Leadership resources. Cool, isn’t it? Of course, if you are missing any healing abilities, then those 3 free resources would be also the last resources Glóin would generate. And that would be a great shame. …(!SPOILER!) and when you get Parting Gifts from Journey to Rhosgobel, then other heroes from any sphere can profit from this ability. Or just attach him any sphere-changing Song. Still I am talking about Glóin without any Hit Points boosting, so if you add for example Citadel Plate from Tactic sphere, then you create efficient resource factory. Now combine Glóin’s ability and some treachery card from encounter deck that would cause damage to you, for example: Necromancer’s Reach. Instead of frustration from damaging your character satisfaction appears – why not, when Glóin transform damage to resource. It follows that you won’t have to be afraid from committing him to a quest (of course if additional damage wouldn’t kill Glóin). I prefer Glóin in my decks, when I’m choosing heroes from Leadership sphere, mainly because of his great response, which allows me generate good number of resources. Though Leadership sphere generally hasn’t problem with scarce resources, even in this sphere expensive cards exist and with Glóin you can call them up to a game more quickly. Probably only disadvantage I can come up with is necessity of Lore sphere presence, at least for healing Glóin. Without it you waste his response and decrease his significant usefulness. Is Guard of the Citadel valuable enough for 2 cost? 1 Willpower does make only cosmetic modification when you are questing. 1 Attack alone kills maybe Eastern Crows, otherwise he won’t hurt most of enemies. And with 0 Defense and 2 Hit Points this soldier falls down after a scratch. Or two scratches. Just immediately in the most cases. If you get into a play ally with bad stats and you just need to do with him something, anything, then chump blocking should be the proper activity. Cheap allies often serve as modest shield against strong attacks, which could be dangerous for your heroes. Luring an enemy to a weak ally and then striking him down with other characters is common tactic. However, if you plan to sacrifice ally in this manner, you may demand low cost. Is Guard of the Citadel cheap enough for such sacrifice? Maybe, 2 cost is border value, for which I am willing to sacrifice an ally, with knowledge that he wouldn’t survive this round. Only one thing can raise him up and improve him – trait Gondor. Although the Gondor trait will be expanded upon many adventures packs and expansions further, in the Core set we have one card with Gondor synergy after all. For Gondor! works not only with the Attack value of all characters, but characters with the Gondor trait also get +1 Defense until the end of the phase. Applying this to the Guard of the Citadel you get finally a character with 1-2-1-2, which is very nice and finally he gets at least some Defense. So he can survive 1 round more from 2-Attack enemies (means from 10 types of enemies in Core set). Nevertheless, you need to use 2 more Leadership resource for reaching that state, so you spend 4 resources overall to get 1-2-1-2 ally and just for one phase. After that Guard of the Citadel becomes a weak fellow again. Guard of the Citadel will appear in your decks for sure – because you can’t choose from plenty of Leadership allies and you are glad for each ally under your command. But when there’s an opportunity, you should change him for a better ally and maybe less “vanilla”. After a quite underwhelming first Leadership ally, we are introduced to the first unique ally named Faramir. Unlike the previous Guard of the Citadel we are pleased by seeing higher stats and more text underneath his traits. Though at first view the cost of 4 resources looks pretty horrible for new players, I guarantee you that you will be including him in most of your Leadership decks for a long time, because he has an important influence in almost in every game where he appears. 2 Willpower, 1 Attack, 2 Defense and 3 Hit Points – with these stats he looks like a half-hero, which is supported by his unique symbol. He can quest pretty decently and is capable to protect you from enemies. Actually, he belongs to the best defending allies we meet in Core set. With 2 Defense he absorbs many enemies with average Attack and if it isn’t enough, he is secured by 3 Hit Points. Don’t say you aren’t amazed by his parameters. Surprisingly, Faramir’s task lies somewhere else than in defending. Read his action: “Exhaust Faramir to choose a player. Each character controlled by that player gets +1 Willpower until the end of the phase.” After I read it, one word comes to my mind: Overpowered. It’s such a powerful ability with global impact that I wonder why no errata was applied for it. But the reality is that Faramir has no limit. Not once per round or for example only “each ally” (even after such edit Faramir would remain as a great ally). When we look at the Guard of the Citadel, we just think “poor guy”. At one side we have a crummy ally, who can’t do anything well, on the other side we have a “super-ally” with amazing defending potential and “by the way” a superb ability. I have doubts about balance among allies in the Core Set to a certain extent. 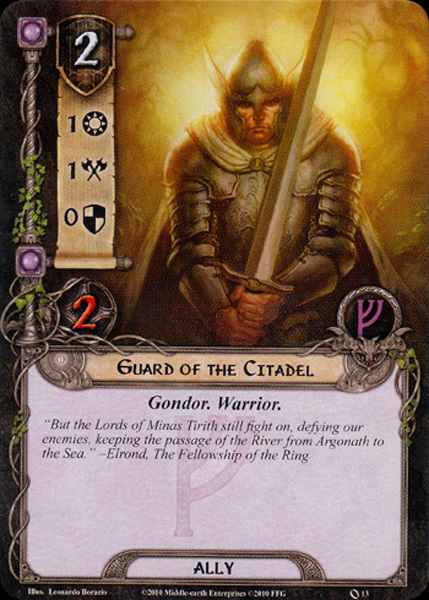 But perhaps that’s the thing we love in LOTR LCG – variety of cards, some are weak and some are strong. And it depends only on us, how we deal with their strengths and weaknesses. At the end of review I want to mention interesting combo with event Ever Vigilant. 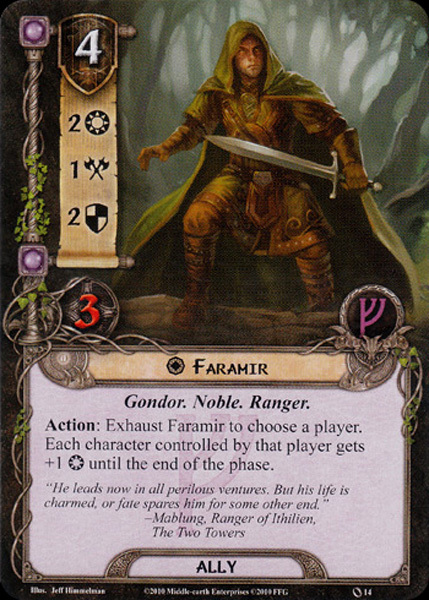 The card itself isn’t so good, but with Faramir you can even use his action twice: you add unbelievable +2 Willpower to all characters of one player! With that power you success in a current quest almost in every case. And why I haven’t mentioned the Unexpected Courage, that universal super attachment? Because it works only for heroes, not allies. Don’t forget that! After one champion and one wimp comes to us one interesting and mysterious ally, Son of Arnor. It’s another member of the Dúnedain family, although you won’t utilize his trait for a long time. When we look at him, we suddenly notice that Son of Arnor won’t quest or defend – with 0 Willpower and 0 Defense + 2 Hit Points it doesn’t make sense. You may use him as a scapegoat for some attacking enemy, but for 3 cost it’s a pretty expensive joke. Only 2 Attack could help you in attacking effort to some extent, still, it isn’t enough to justify that 3 cost. If we call him to the game, then it would be because of his response. When he enters play, you choose some enemy in the staging area or engaged with another player, and you engage him. It’s another example of a card, which works with the staging area. Before we could admire Dúnhere’s ability to attack enemies in the staging area, or Thalin’s ability to deal 1 damage to all revealed enemy from the encounter deck. Son of Arnor doesn’t deal direct damage as the previous characters but helps you with managing the staging area or other player’s engagement area. And what good is it to us? First – you get rid of some threat in the staging area before staging itself. So if you left, for example, Ungoliant’s Spawn or Nazgúl of Dol Guldur in the staging area before and now you need to reduce overall threat value, then do it with calling Son of Arnor to a game. Ok, maybe you left such enemies in the staging area simply because you are not prepared to engage them for now. But there are some types of enemies you want to engage almost under every circumstance. If Goblin Sniper awaits you in the staging area, you can’t engage him optionally – you have to left him alone in the staging area. Otherwise, you deal 1 damage to any of your character at the end of each round. You won’t be glad for such an effect (if you haven’t got Glóin or Gimli). And Son of Arnor can drag that annoying Goblin Sniper from staging area to you (it doesn’t count as “engage him optionally” because it’s not classic player engagement step in encounter phase). Another good example I can think up is using Son of Arnor’s ability on Wargs, pretty nasty enemy. If you have Quick Strike, which you could use on a proper character, then you can kill Wargs just before the combat phase would ever start. Second – you can help another player from an enemy that is engaged with them. This is very useful in a case, where one deck serves as an offensive deck and other as a questing or supporting deck. Questing decks needn’t excel in attacking, so you can get in that situation, where you are overcome by many enemies or you have a problem with some strong enemy. Son of Arnor can reduce the number of enemies or entirely grab such a strong enemy to its own engagement area. It’s one possible solution, how to help your friends directly, if you miss some Sentinel character on the table. However, this guy doesn’t fit in every deck. Because his ability is a little bit specific, you won’t need his services in every scenario and every situation. Purely using for his stats is not very clever and forethoughtful. I see him as a suitable Leadership ally for your sideboard. I’m happy to introduce you one of the most useful, cheap allies that get to our hands. I must say that if I’m deckbuilding from the Leadership sphere, I auto-include Snowbourn Scout in my deck, just because there is no reason to skip him. It may be funny, but he is something like A Test of Will among allies – you automatically add him to your deck without thinking or any doubts. 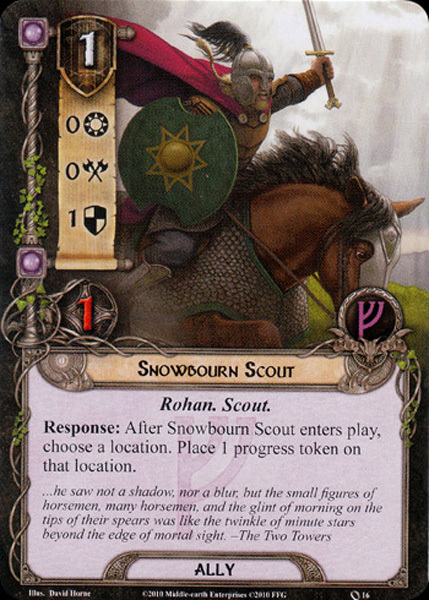 But why do I like the Snowbourn Scout, when he has such tiny stats? Why would he be useful for me? He can’t quest, he can’t attack, even defending with him is mostly matter of one round. Welcome to the world of 1-cost allies, where cheap means useful. With 0 Willpower, 0 Attack, 1 Defense and only 1 Hit Point you know, that his main role will be chump blocking. Chump blocking is voluntary sacrificing your weaker allies in order to save another, more valuable character before some strong attack of enemies (for example Ungoliant’s Spawn, Chieftan Ufthak etc.). You won’t regret such an ally – 1 cost doesn’t hurt you and you save your heroes and/or stronger allies for one round. I admire that he has got at least 1 Defense, which is more useful than 0 Defense of Guard of the Citadel, as I mentioned in his own review. You can at least block and “erase” weak enemies like Eastern Crows, without counting +X Attack from Shadow effect (of course, in further adventure packs and expansions number of 1-Attack enemies slowly grows). The great thing is that Snowbourn Scout doesn’t belong to “vanilla section” as Guard of the Citadel. You surely use his beneficial response, which says: “After Snowbourn Scout enters play, choose a location. Place 1 progress token on that location.” I’m very happy that we’ve got this simple, but nice little effect in the Core set already. For new players, 1 progress token looks tiny and as an unimportant effect. However, there are really many situations, where that mere 1 progress token saves you from location lock. We have directly locations, which are predestined for Snowbourn Scout because of 1 Quest Point (The Brown Lands). Then, we have locations with more Quest Points, but depending on the situation, our ally can do an important job for us. For example, if you quest with Northern Tracker, another champion in questing, you add 1 progress token to all locations in the staging area. Snowbourn Scout can speed up this process of location cleansing and get rid of some location one round earlier. It is best to call Snowbourn Scout when the selected location has 1 Quest Point left to complete exploration. Don’t forget that his response is valid even for active location so it can help you in this way as well. Now try to imagine, what Snowbourn Scout can do with Sneak Attack. 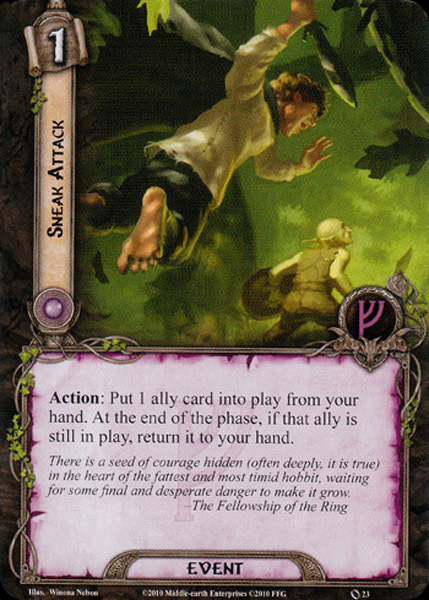 Personally, I save Sneak Attack for Gandalf’s arrival, but if Gandalf is missing and you need to clear some location that has 2 progress tokens, use Sneak Attack on Snowbourn Scout. One round you place first progress token, next round you add the second token and by then you are able to explore such locations like Necromancer’s Pass, Great Forest Web or Enchanted Stream. 1-cost allies are very desirable (and also rare) because of their cheapness. If this ally can do in addition anything else than be only a chump blocker, his significance grows even more. And Snowbourn Scout belongs to “elite” of this kind of allies. After three, quite variable allies we have returned to the “vanilla section”. 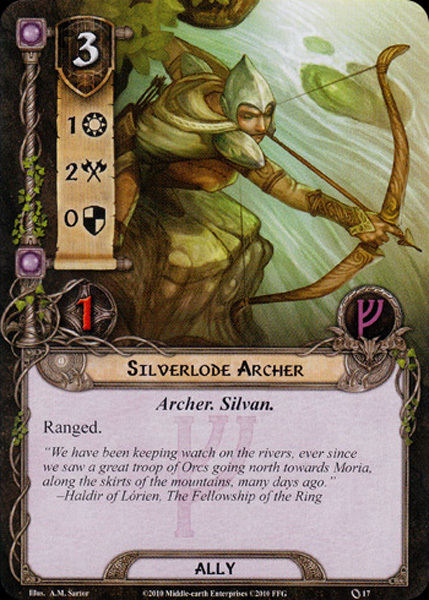 Silverlode Archer is very similar to the mentioned Guard of the Citadel, with all its weaknesses. Guard of the Citadel has a few advantages – one of them was a relatively cheap cost (however in the context of stats and no present ability it was still somewhat expensive). Silverlode Archer hasn’t even got this advantage. Instead of 2 cost we will spend one more resource to play him. Look at his stats: 1 Willpower, 2 Attack, 0 Defense and 1 Hit Points. His main domain will be attacking; it’s obvious at first sight. But I found out one interesting “detail” – summarize his stats and you get a value of 4. We could call it as “overall stat strength” (=OSS). Do the same for Guard of the Citadel – you get also number 4 (1-1-0-2). Why is Silverlode Archer more expensive with the same OSS as the Guard of the Citadel? The reason is adding one keyword – Ranged. This keyword is fairly uncommon in the Core set and I would say it’s valuable in this game in general. Of course, in solo games this benefit is absolutely useless, so 3 cost doesn’t make sense in solo environment at all. However, in the multiplayer environment, you somehow need to interact with the engagement area of other players and attack at a distance. From this point of view Silverlode Archer is acquiring value at least slightly. Second and last Ranged ally we meet in Core set belongs to Tactic sphere, Horseback Archer. Legolas has also got the Ranged keyword, but he is a hero. We haven’t got a wide choice here in sense of Ranged characters. As with Guard of the Citadel, I thank designers for at least some traits. I skip Archer, which is useless and without any synergy. Silvan is more interesting and gets better in future expansions (Ring-maker cycle)… Yes, many expansions further. And that is looong time to upgrade your Silverlode Archer into something more useful. Meanwhile, you get more valuable Silvan characters and this ally finally falls into oblivion. I haven’t got much else to say about the Silverlode Archer. With no ability, we could only discuss the narrative text under Ranged keyword… no, I’m kidding. It’s sad I can’t analyse him as deep as I want, because there is nothing more to discuss. The last thing I would mention about this ally is that he belongs to one of the first Leadership allies I remove from my decks without any doubts. From the start, you are glad for any Leadership ally you get into a play because in the nearest adventure packs you get very few Leadership allies. (!SPOILER! actually only two allies, what is the lowest number of new allies from Shadows of Mirkwood cycle, a costy Dúnedain Watcher and not very good Keen-eyed Took). So in the beginning, he may appear in your deck relatively often. But at the first opportunity, you should try to remove him from decks as soon as possible. 3 cost for 1-2-0-1 ally, who can be eliminated even after the Eastern Crows shits on him, is just pathetic waste of resources. The last few allies represent the “expensive elite”, where cost value should reflect their strength. Except for the brilliant and very useful Faramir with cost 4 from the beginning, the first “elite swallow” (however quite poor and embarrassing) was the Silverlode Archer with 3 cost. Is Longbeard Orc Slayer with a high cost of 4 better at it than his predecessor? This dwarf can offer us 0 Willpower, 2 Attack, 1 Defense and 3 Hit Points. Do you remember on OSS indicator, that is overall stat strength? We know that Silverlode Archer has 4 OSS (1-2-0-1) for 3 cost, same as Guard of the Citadel (1-1-0-2) for 2 cost. It means stats of Silverlode Archer isn’t worth it. The OSS of Longbeard Orc Slayer is 6. Not bad, isn’t it? Wait, we have met another 4 cost Leadership hero, Faramir. His OSS reaches more interesting value – in fact, 8 (2-1-2-3). Of course, he is a unique character, so he should be stronger than your more common ally. It shows us at least in numbers that we can find differences among same-cost allies. However, take these overall numbers with reserve – more important than OSS is stat distribution and of course ability and keywords of allies. So when we look from this point of view at our Dwarf ally, we can say he is able to attack and even somehow defend. Against average enemies he can stand 2-3 rounds (so I would be careful with using the nickname “Slayer” in his case :)), but I hate to defend with such an expensive ally. On the other hand, Leadership sphere specializes in resource generation and acceleration, so 4 cost (and I should mention it at the beginning) isn’t such obstacle, how it looks like. What I like about this guy is his response. After he enters play, he deals 1 damage to all enemies with the Orc trait. And because Orcs are a very common kind of enemies, the chances that you hit more than one enemy are quite big. Yes, you should prefer to play Longbeard Orc Slayer in the mid- and late game, when you build up a good base and some reasonable number of somehow injured Orcs is in play as well. But when he enters, you can get rid of some Orcs. 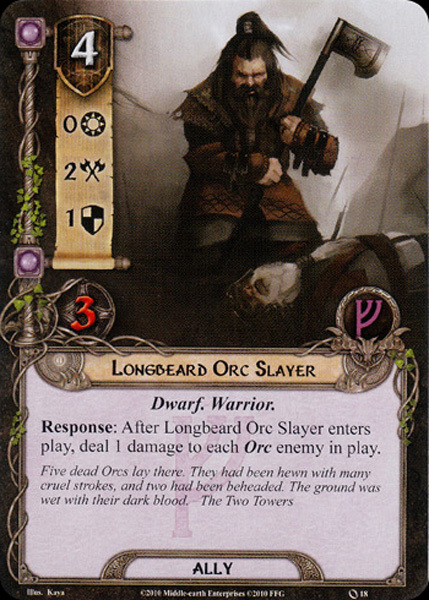 For really superb using of Longbeard Orc Slayer, you need at least 2 cards from Core set that makes him truly “Slayer”. First, go with the hero Thalin, who deals 1 damage to every revealed enemy during staging. With this combo, many Orcs can fall without investing great effort. You at least are able to save the lives of some of your allies and heroes. Second, you should use Sneak Attack on Longbeard Orc Slayer and thanks to it, his damaging potential grows even more. With Thalin and Sneak Attack, you are able to deal in 2 rounds 3 points of damage directly to all Orcs in play, only with overall 5 cost and without any restriction. It sounds very powerful to me. But does that really happen in practice? Hardly, rather unlikely. Though combo Thalin-Longbeard Orc Slayer can really work in practice (and I have experienced these games), adding Sneak Attack to this combo can happen maybe in 1 from 10 cases. I know that Longbeard Orc Slayer doesn’t enjoy much popularity in the community, for negatives I have listed before (cost, damaging only Orcs etc.). !SPOILER! Yet I suppose his inner strength reveals in next expansion Khazad-Dum cycle and even earlier with coming of Dáin Ironfoot to scene. Furthermore, Longbeard Orc Slayer together with Thalin can be killing machines in Seventh Level. I don’t condemn him at all. I know he can be useful in a well-built deck and with good timing for his ability. He won’t shine in scenarios, where Orcs are a minority, then you have only an expensive ally with not a very good stat distribution. Still, he belongs to Dwarf family. And Dwarves generally rule in near future so he could persuade you to not abandon him forever. And here we are… maybe the most hated Core ally comes to the sunlight in order to submit my critics. Welcome, Brok Ironfist, the King of Damned and Lord of the Forgotten. If any ally has most adversaries and mockers, it is this 6 cost Dwarf. But what is the reason for such hatred? Is it rightful criticism? Or is Brok Ironfist just misunderstood? When we look at this card for the first time, several things attract our attention. The first one is a big and striking number 6 as the cost of this character. Until now no character has been so expensive. The second one is the unique symbol at his name. The third one is relatively high stats. Combining all of these characteristics new players could say “cool, I have got a strong ally at my side!” But after the first glance, we have awoken from our delight. 6 is a really high cost for any card, so it should be a very, very useful and powerful card if we decide to put him in a deck. We should be glad that this ally belongs to the Leadership sphere – that means a lot of resource generation and acceleration. For 6 cost we get 2 Willpower (so he is able to quest decently), 2 Attack (so he can participate in attacking effort decently) and 1 Defense with 4 Hit Points (so he copes with 2-3 attacks from enemies). Well, with this distribution of stats I would say that Brok Ironfist is least appropriate to defend with, because risking his life after you get him into a play could mean 3 things: either you have a disgusting number of resources for foolish wasting, you are absolutely greenhorn in this game… or the encounter deck has pushed you to the corner in such a way that you haven’t any choice to do it somehow else. All possibilities are not good (but if you are a greenhorn, your ignorance is understandable and you need more experience :)). In short, you should avoid unnecessary gamble with him. So two options remain for Brok Ironfist, what he is able to do: questing and/or attacking. Wait, did I forget his ability? Well, I shouldn’t! Let’s have a look. 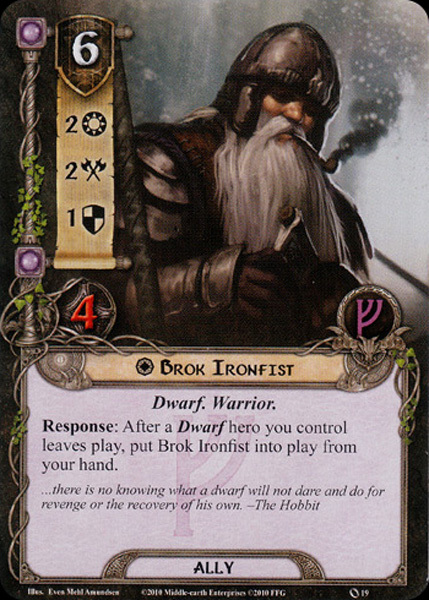 After a Dwarf hero you control leaves a play, you are able to put Brok Ironfist into play from your hand, for free. In Core sense, after Gimli, Glóin or Thalin are removed from a game, you don’t have to take into account his 6 cost, but you play him for free. This sounds quite good. Or not? I have to ask you: could be your strategy to let your hero dies and replace him by an ally? Do you attempt to leave your hero to the threat of encounter deck or do you protect him until the last breath? Second possibility should be the right one. Heroes are most valuable character in any cases. So if any Dwarf hero dies under your hands, it just means you have chosen bad strategy, which leads to his death (or you have just bad luck). And dead hero often means fast game over. I understand what designers think: Brok Ironfist should deputize any Dwarf hero, he is “half-hero” if I overstate it. But I bet that Brok Ironfist will be sitting in your hands until you save up that horrible 6 resources to put him into a play. If you play well or just carefully, there is very minimal chance you will play this ally on the basis of his response. Now I should end this and say “this ally doesn’t worth it”. But if you want to know some good possibilities for him and spoilers won’t you mind, then read on. !SPOILER! After Dáin Ironfoot appears, things change a little bit to the advantage of Brok Ironfist. With +1 Willpower and +1 Attack very good ally is born – 3-3-1-4 are stats of fully-fledged hero, who is excellent quester and warrior. Note, that such Glorfindel with starting threat 12 has stats 3-3-1-5. And when Khazad-Dum comes to a scene, usefulness of Brok Ironfist grows even further – with many Dwarf-synergy cards he changes to something more bestial. Only that 6 cost remains. However, without any boosting help from other cards he is just criminially expensive. He is possessed by unusable ability, which you rather shouldn’t try to utilize, because any Dwarf hero will be always more valuable than Brok Ironfist. Let go of Brok Ironfist and move on to our first Leadership event, which is Ever Vigilant. The card shows us a high, mysterious mountain, to which leads way or bridge protected by a warrior in plate armour. Actually, I have noticed the whole scene just right now. And when I’m watching and thinking even about the action of Ever Vigilant, I must question myself: why I haven’t used it so much? For a cheap and sympathetic 1 cost we can do a very simple, but effective thing: ready one exhausted ally. Okay, this is not glorified Unexpected Courage, which prepares an attached hero to another action and can change the game significantly. This one-time “light version” concentrates on our allies, which often serve as chump blockers or have supporting roles in questing or attacking. With Ever Vigilant you are able to exhaust ally in order to defending and ready him again for attacking in next step (if he survives enemy’s attack before). Or send ally to a quest and ready him for defending or attacking. These actions are simple using of Ever Vigilant and there is nothing bad about it. However, there are some allies, which could utilize this card in more effective way. Look at Faramir. His action says that after exhausting him you choose a player and add +1 Willpower to all of his characters. Now imagine you could do it twice; +2 Willpower for all characters would be solid portion of Willpower. And with Ever Vigilant you are eligible to do it in real! Any threat strength in staging area would hardly stop you. Or another example, this time from Lore sphere: Gléowine can add 1 card to one player after you exhaust him. Use Ever Vigilant and Gléowine becomes an ally version of Beravor – you draw two cards in one round. Or use this event on Daughter of Nimrodel; instead of healing 2 damage you heal 4 damage – you are able to actually fully recover heroes, just during one round, thanks to effect of Ever Vigilant. And of course, we shouldn’t forget that Gandalf is natural aim for this event, because his amazing stats can help you in any situation – questing, attacking or defending. I could continue in that several next pages and think up many examples, where Ever Vigilant comes in handy. The point is that every ally with any action, which requires exhausting character (that isn’t limited for once per round), can be duplicated by Ever Vigilant. I confess that I don’t add Ever Vigilant to my decks. Maybe just because there is no remaining room for it, or I haven’t many allies with exhaust-and-use-action in my decks, so it wouldn’t worth it. However, I believe it is quite a useful card, though you need available allies as suitable targets for it. It has own value, which shouldn’t be underestimated. Now we come to the events, with which I have zero experience. Common Cause belongs to Leadership sphere and costs 0, so I can say at least you won’t pay for this event any resource, if anything. Its action states that you exhaust 1 your hero in order to ready another hero (of any player). Even in my beginnings I was vainly searching any good use for this card. And after some time, which I have spent with this game, I’m thinking up the good using of this card with difficulties even now. I was forced to search for help in forums and other reviews, if players find some miraculous utilization for Common Cause. I found some answers. But let me present my own ideas first. In theory, if you exhaust some multifunctional hero and you need him in another task, then you would exhaust another unused hero to ready your desired hero. However, there is small snag – how often this happens? When you are choosing heroes to your deck, then every hero has his own special task. Usually one is defender, one attacker and one quester. Or one of them has special ability, which could help you in another way. So everyone are often very busy, probably every round. Can you dare such a luxury to not use some hero and let him ready for using this card? It may occur in peace time, when no real danger threatens you. For instance, you are saving Eleanor for cancelling some treachery, which could be revealed from encounter deck. But this round no treachery comes to bother you. Because Eleanor has only 1 Attack and 2 Defense with 3 Hit Points, she doesn’t fit to other actions very well. She is quite fragile hero. This round you have just defended some strong enemy, who have damaged Gimli for a couple of damage tokens, and immediate striking back the enemy in the same round would be helpful for you. So after then you play Common Cause, exhaust ready Eleanor, ready exhausted Gimli and after resolving all attacks of enemies you can hit back with Gimli. As you see on this example, using of Common Cause is relatively complicated. It counts with specific situation, where all preconditions must be fulfilled. When I was searching for help in LOTR LCG community, I found some interesting ideas to use Common Cause, but I warn you: spoilers coming, because you need some cards from next adventure packs and/or expansions. !SPOILERS! Common Cause can synergy with heroes, who have “ready-abilities”. Boromir – for raising 1 threat he can ready again. Elrohir and Elladan – both of them can pay 1 resource for ready them again (after declaring them as defender/attacker). But Common Cause can synergy even with readying-attachments. Unexpected Courage or, another Fast Hitch, that is Unexpected Courage-version for Hobits. Still, for Common Cause you need to “waste” actions of these attachments. In my point of view, if you need some hero to be ready more times, then you just simply attach him these ready-attachments and you don’t need complicated way in style of Common Cause for that. You know, if this event doesn’t recommend for its actions exhausting some hero, then it would be very powerful event, for which I wouldn’t hesitate to pay even 2 resources. Shame, this is not case of our Common Cause. Maybe with SPOILERs heroes mentioned above it could work. Otherwise, I can’t recommend Common Cause for putting in any of your deck. Hurray, beat them all! For our friends! For our King! For Gondor! I like the name of this card. In the game, with an army of enemies, when your heroes and allies are bleeding and they need to raise morale and fight with heart… then you pull out this event from your hands, shout “FOR GONDOOOOOR!” and all of your warriors charge to combat to beat this army of darkness. Thematic, isn’t it? Let’s leave the combat field and return back to reviewing. Our third Leadership event costs 2 and its action allows us to add +1 Attack to all characters until the end of the phase. Additionally, all Gondor characters gain also +1 Defense until the end of the phase. At this moment we finally got some card with trait synergy. Though in Core set there are no many Gondor characters, we will gradually become acquainted that traits are playing an important role. Now we finally can build a deck a little bit based on some trait, in this case, the Gondor trait. Before we are going to enumerate all Gondor characters from the Core set and think up some good possibilities we have, let’s examine the action of For Gondor! itself. I admire that event is valid for all characters on the table. No such things as “all characters you control”, “all heroes”, “all allies” etc. It globally influences all creatures at our side, no matter if you play solo or multiplayer game. That’s superb and definitely no automatic matter. Just look at some Core set cards, which are restricted in such similar way (Beorn’s Hospitality). Thumb up for no limitation. Even in this form, without anything else, I would gladly pay 2 resources for this event, it’s a proper cost. Of course, the more characters are in play, the bigger impact it will have in a game. You only need to have prepared sufficient number of characters able to attack. This can help you beat strong enemies with good Defense and great amount of Hit Points, like Hill Troll or Nazgúl of Dol Guldur, the main antagonists of Core set. Where quality is missing, you can reach it by quantity. Now let’s move to second part of action: +1 Defense for all Gondor characters. There are overall 5 characters with Gondor trait in Core set: Denethor, Eleanor, Faramir, Guard of the Citadel and Gondorian Spearman. Denethor thanks to this event becomes a master of defending, 4 Defense absorbs majority of attacks. Eleanor gets 3 Defense, it’s also very impressive, though Eleanor is not born to be a quality defender. Faramir is commonly used for his ability, so his impressive 3 Defense will probably remain unused (but Ever Vigilant could correct it). Guard of the Citadel and his 1 Defense won’t save anything in most cases, so Gondorian Spearman, I would say, is one of the best target for this event. 2 Defense can fight off weak and under-average enemies, but considering his ability he may survive at least one more round, which is very useful – dealing 1 damage to the attacking enemy is ability, which you would want to use more than one time for sure. With For Gondor! it is possible. You can try to make your first trait-based deck from Gondor characters in order to maximize effect of For Gondor! But I consider this secondary effect is not necessary for adding For Gondor! to your deck, just because of that there is limited number of good Gondor characters. So still remains +1 Attack effect, which in my point of view is main advantage of For Gondor! I see the event For Gondor! as a useful card, though with expanding your card pool it frees its place for coming better and stronger cards. 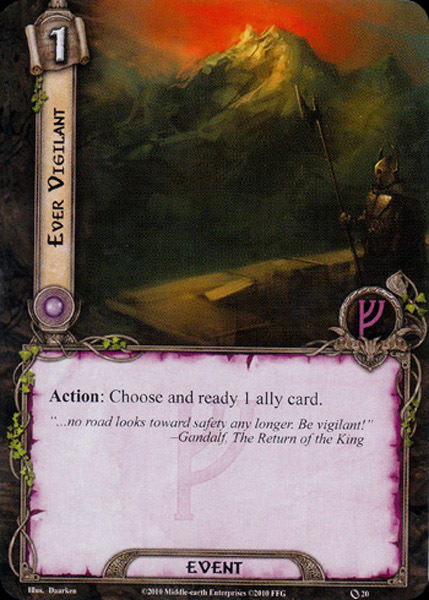 Finally, it remains more or less forgotten, though in Gondor decks you could include this card in. Like A Test of Will in Spirit sphere, Sneak Attack is an event from the Leadership sphere with such great effect for such low cost, that I can hardly imagine playing any Leadership deck and simultaneously not including this card. The importance of Sneak Attack is just indisputable, no matter how much further are you with adventure packs and expansions. So what are we gonna do with this 1 cost event? It’s easy like smack to the face – we put one ally into a play directly from our hands and if this ally is still alive at the end of the phase, he returns back to our hands. It reminds me fast intervention of Special Forces – appear, destroy and withdraw, just like on the picture with ambushing hobbit. Sneak Attack might incite us to use it during combat phase, in a moment of attacking or declaring defenders, but we can use it even during quest or another phase. Undoubtedly the most frequent target for Sneak Attack is mighty Gandalf. This combo can get you from such a mess, which otherwise could mean game over. Sudden dealing of 4 damages can destroy unwanted enemies in engagement area your or your friends, or in staging area. Simultaneously annihilation of enemy in staging area causes reduction of overall threat strength. Play it whenever it is necessary and comfortable for you. However, keep in mind some restrictions: for example after committing characters to a quest and staging you are not allowed to play Sneak Attack and send that character to a quest additionally. You can do it only at the beginning of quest phase. Same situation could be applied on combat phase. You have just let some enemy’s attack undefended and after revealing some nasty shadow effect you would get into an awkward situation, where you could lose a hero. Unfortunately, you are not allowed to resolve that by Sneak Attack, when you would want to Declare Defender and block that attack additionally, because step of Declaring Defender has ended one step before already. For better understanding I recommend you study the Action Windows from LOTR LCG Quick Reference or new Rules Reference from 2018. Combo Sneak Attack-Gandalf is the best known and maybe the most used, although there are other good adepts, who also serve as great targets for Sneak Attack. I list at least some of them: Longbeard Orc Slayer, Faramir, Snowbourn Scout, Beorn and many, many other allies from further adventure packs and expansions. Actually, every ally can be valid target for Sneak Attack, but some of them are better, either because of their special abilities, or because they are expensive and you need their services immediately (boost your questing effort, block some strong enemy or on the contrary destroy some enemy). Sneak Attack is auto-included in nearly all of my Leadership decks. Its low cost, super effect and universal usage, all of these make this event very powerful, maybe the most powerful event from Leadership sphere in the Core set environment. I’m always surprised that even we are still moving in Leadership sphere, sphere where resources are not scarce commodity, we have got 5 events with cost lower than 2. Among them belongs also Valiant Sacrifice for 1 cost. So another very cheap event in sphere, where I would expect events for average 2-3 cost (try to compare with Lore sphere, where resources are very scarce and still events are unfortunately somehow overpriced). This is in overall third event, which concentrates on allies and not heroes. It has response, after an ally leaves play, his controller draws 2 cards. It reminds me Boromir, who sacrifices himself in order to save Frodo Baggins and Samwise Gamgee. Probably this scene is really pictured on this event. 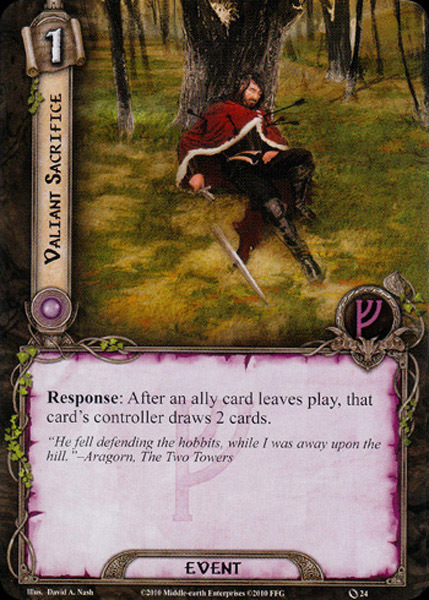 Valiant Sacrifice behaves same – after your ally leaves play, no matter if he is destroyed or on the base of its ability (Gandalf), you draw 2 cards as the satisfaction. You may ask, why should I allow or even support leaving my allies from play? Should I rather keep them alive as long as it is possible? I agree with you – I also try to my allies them in play for long as it is possible. But as I said above; destroying allies is not only allowed way to trigger this event (though there exist decks based on this strategy). Allies can leave play because of their ability or another triggering mechanism. Gandalf belongs to such “leaving ally” and excluding him also Beorn. In close adventure packs we meet other “leaving allies”, who help us to use this event more frequently. Otherwise, also events can make with Valiant Sacrifice a great combo – for example Sneak Attack. Nevertheless, it is tru that Valiant Sacrifice works often and good with destroying specific kind of allies – chump blockers. Allies like Snowbourn Scout, Guard of the Citadel, Gondorian Spearman or Wandering Took are suitable target for Valiant Sacrifice. Destroying such allies won’t you hurt so much, if you get some good cards instead of them. And additionally, if you attach to some hero Horn of Gondor, you make excellent combo with drawing cards and generating resource at one time. …we rather find this effect in Lore sphere, the main domain of cards drawing. I have good experiences with this a little bit forgotten event. Take this opportunity and if you have some free place for Leadership event, try to include Valiant Sacrifice into your deck. You can help with drawing cards your friends too, so under each circumstance you won’t make a mistake. Like with allies, now we have got kind of event, which I call as “elite”. “Elite events” are distinguished by high cost and commonly strong effect with considerable impact. Every sphere has its own “elite event” in Core set. Grim Resolve is our first representative of “elite event”. We immediately notice the high cost 5, which belongs to highest in Core Leadership sphere (only Brok Ironfist costs one more). Even with resource generation it takes longer time than we can play this. And according to effect we have to wait for suitable moment. That moment is exhausted characters. Grim Resolve’s action says: “Ready all character cards in play.” Playing this event is worth it in the late game, maybe in the mid game. The base of functioning of Grim Resolve lies in amount of allies – the more allies are in play, the more powerful will be final effect. Undoubtedly in multiplayer with all 4 players this event will shine like supernova, with less and less players the cost will gradually outweigh the advantages of Grim Resolve. However, if I sound to you very critical, I guarantee you that I see Grim Resolve as very good and useful card. How helpful this card can be, depends on a moment, when you would like to play it. I show you two main utilization of Grim Resolve, two different “playing style” of the same card. First: playing after questing in order to be prepared for combat phase (defending and/or attacking). This playing style enables you to send whatever number of characters in order to maximize your chances in progressing quest. Some stages of scenarios actually threaten you with a huge amount of quest points or they have some troublesome effect, which you have to get over as quick as possible (for example in Journey Along the Anduin stage 2, Anduin Passage). Sending all characters to a quest could save you from unpleasant consequences of long hesitation in the current quest stage. But you also need “cover your back” – possible undefended attacks of several enemies could break your neck. Grim Resolve allows you to have an open back door if you are really in danger. I recommend you use Grim Resolve just after committing characters to a quest, don’t wait on staging – some treacheries like your characters exhausted, for example Necromancer’s Reach. Though dealing 1 damage doesn’t look like serious problem, some allies are very vulnerable to damaging. Remember, dead characters don’t contribute to overall Willpower Strength. And Necromancer’s Reach won’t be the last treachery with dealing damages during staging (to exhausted characters) you will meet. Second: playing after defending in order to be prepared for attacking. For what do you have all these strong characters, when you can’t hit enemies back? Reaching of numbering superiority is commonly hard problem, because revealing of enemies doesn’t cost anything to encounter deck. In most cases you will be the one, who is outnumbered. And ownership of strong allies and heroes is good thing, but first you need to defense yourself, then you can attack. However, you often haven’t any remaining characters to do so. So again, Grim Resolve comes to scene and let you fully concentrate just on defending, without considering “who should be held back?” Of course, in this case you have to wait until all defenders are exhausted, after then you should play Grim Resolve. Readying all characters is powerful effect. And again, like at For Gondor!, I’m happy for no restrictions of this event. No “all allies”, “all heroes”, “all characters you control”, just everyone on the board. Though I see power and usefulness of this card, I don’t use it in my deck. Why? High cost and situational utilization makes from Grim Resolve dead card in my hands in most cases. I rather get to something less spectacular, but cheaper and playable in most situations. Steward of Gondor may have Steward in its name. But I see it as a king. King of attachments. Hail to the King! Why I celebrate our first Leadership attachments? Let’s leave the ode of pure joy for now and let’s see closer at Steward of Gondor. It costs 2 resources and has unique symbol, so new players beware, two copies of this attachment on the board and in the same time isn’t allowed. But it doesn’t matter, because even one copy can change your game dramatically. Steward of Gondor can be attached to a hero – no surprise, almost every attachment are used just for heroes because of their “durability”. What is less known, read the second text: “Attached hero gains the Gondor trait.” Good for some Gondor-synergy cards like For Gondor! So if you will play some cards like this and you simultaneously have Steward of Gondor attached to a hero, don’t forget he is Gondor character too. 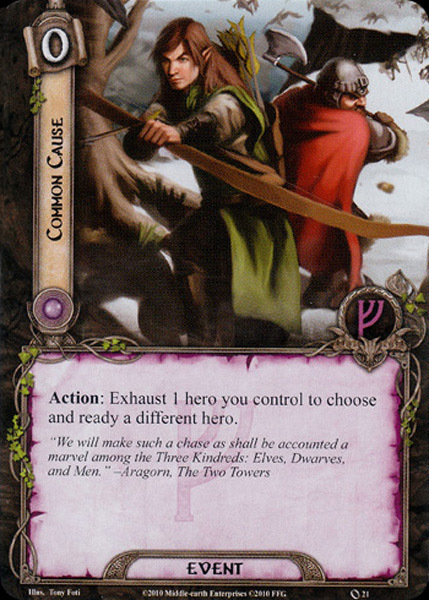 However, the third part, more precisely action, says the key ability of this card: “Exhaust Steward of Gondor to add 2 resources to attached hero’s resource pool.” Every single turn you instead of 1 resource add 2 additional resources, that means overall 3 resources. Every turn. I wonder, why this card hasn’t got own errata till these days. But it’s still here and valid, useful, powerful, wonderful… 2 additional resources is just crazy amount of resources, with which you can handle at own discretion. In one turn you can call any 3-cost card to a game. In two turns you are able to play all these terribly costly cards like Gandalf, Brok Ironfist, Beorn etc. In short and well, with Steward of Gondor you stop solve issues with scarce resources and expensive cards. Of course, if you have multisphere deck, you’ll be happier with this effect than if you have monosphere deck. But it can help you in every cases and situations. It’s funny, that sooner or later you will solve the opposite problem – what should I do with all these resources? If you have more resources than cards, in a moment you have empty hands and hundreds of unusable resources. I experienced this many times. The solution could be adding some cards with drawing-cards effect (like Valiant Sacrifice, Lórien’s Wealth, from heroes Beravor). But it’s quite harmless secondary effect. More serious would be situation, in which you decide to attach Steward of Gondor to wrong hero. Think twice, where you really need resources for playing cards and where you willingly wait couple of rounds. 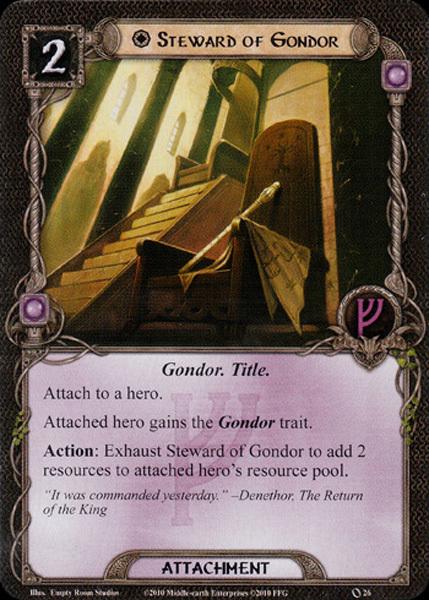 In general, Steward of Gondor belongs to hero, who represents given sphere stand alone, or hero from sphere, which is famous for their high costs (typically Lore). The worst thing, which could happen, would be generating resources in a sphere, where you actually don’t need it, and lacking of resources in a sphere, where you need it so much. If I’m sometimes talking about resource generation and acceleration as an aspect of Leadership sphere, then from 90 % I mean Steward of Gondor. This card embodies Leadership sphere without any doubts. It’s essential card, absolutely irreplaceable in any Leadership deck and if you put this card in 3 copies into your deck, it doesn’t matter it has unique symbol – the sooner you get Steward of Gondor into your hands (ideally in opening hands), the better for you and your game. As I said at the beginning: Hail to the King, or exactly Hail to the Steward of Gondor!!! 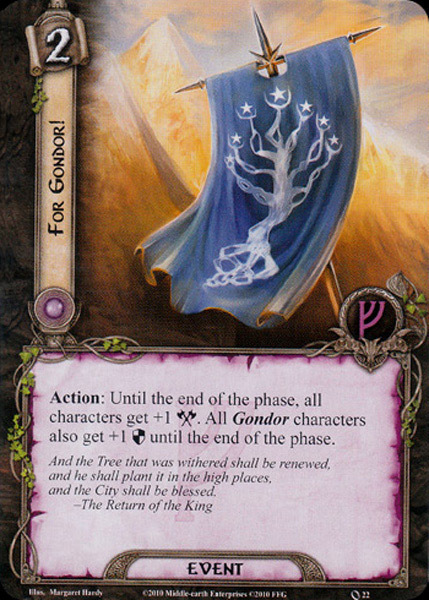 Second Leadership attachment has unique symbol as Steward of Gondor, so we may prepare for another pretty strong and memorable card, which can help us against threats of encounter deck. Let’s meet Celebrían’s Stone. It costs 2, it can attach only a hero, and has a keyword Restricted. Remember on it, when you are deciding about another Restricted attachment. Single hero can’t own more than two Restricted attachments. The important part of Celebrían’s Stone is coming: you add +2 Willpower to attached hero. You might expect this kind of boost in Spirit sphere. You are right: boosting Willpower belongs to domain of Spirit sphere (for example Spirit attachment The Favor of the Lady). But be glad with effect in this sphere – it just shows, how versatile, flexible and independent is Leadership sphere. It doesn’t need any support from other sphere, like Tactic, which can’t produce enough Willpower to quest successfully, in general. It needs some support, for example from Spirit… or from Leadership with this attachment. I consider as absolutely brilliant that for only 2 cost we have got almost permanent effect of 2 Willpower (of course until moment death of attached hero or discarding on the base of some encounter card). Don’t be deceived by illusion that it happens normally. There are many examples, where you don’t get for some cost appropriate amount of some stat. The mentioned Favor of the Lady could be example for all. !SPOILER! or another attachment boosting Willpower – Dúnedain Quest. 2 Willpower fits to every hero, who is specialized in questing. From suitable heroes, Éowyn is great target and with her 6 Willpower as a base, you should control the threat strength in staging area perfectly. I also see Théodred or Thalin as good choices for taking Celebrían’s Stone. With their modified 3 Willpower both heroes finally become proper questers and you can send them to a quest without doubts about their true role. But the text on Celebrían’s Stone is continuing. If you attached it to Aragorn, he gets Spirit resource icon. In other words, he may use his resources for paying Spirit cards. Just right now we meet the full potential of this card. Aragorn in your party can profit even twice – he gets 2 Willpower and gain Spirit resource icon. He becomes a “sphere hybrid” and helps you with playing Spirit cards. Two weapons in one attachment. No wonder that Celebrían’s Stone has many fans in LOTR LCG, including me. I automatically make a place for this card, if I run deck from Leadership sphere. And I don’t determine its adding by Aragorn presence – Celebrían’s Stone excellently works with +2 Willpower and without other additions. The only one negative I can think up is one copy of Celebrían’s Stone in one Core set. 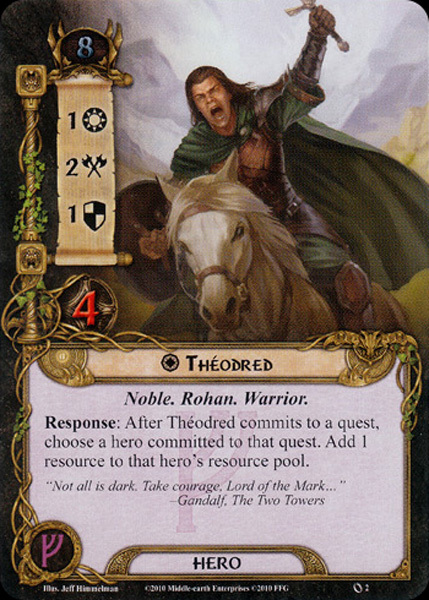 Leadership sphere offers us 3 initial heroes we meet first in Core set – Aragorn, Théodred and Glóin. The highest ranking deserves undoubtedly Aragorn. Thumbs up for his versatility, his great stats and useful ability, which allows him to prepare, with paying of 1 resource, after committing him to a quest. Auto-included “readying-effect” is rare phenomenon. Théodred, on the contrary, astonish us only with his ability – his distribution of stats is mystery for me and even I admire ability, which adds 1 resource to any hero who is also sent to a quest, it isn’t enough to compensate his “oddness.” And Glóin – my dear Glóin, I have experienced with you many adventures and you please me with many generated resources. You are always welcomed in my party. Well, heroes from Leadership sphere primarily help us with resource generation in order to paying such expensive cards like Longbeard Orc Slayer or Grim Resolve. They are alternatives to ultimate Steward of Gondor, except Aragorn, who concentrates on strengthening of himself and help you in questing, attacking and defending. If I need to boost my resource generation, I pick Glóin and when I need some muscles and wisdom, Aragorn joins my party. I consider Leadership heroes, excluding Théodred, for useful main companions. We have overall 7 type of Leadership allies, so we can choose from a wide offer. But 5 of them rather hide in card pool or in sideboards than in main decks, because of their high cost and/or specific or non-sense abilities. I’m going to start with the worst, what Leadership can offer us. And guess what, it isn’t Brok Ironfist, one of the most hated allies ever, because I still see in him some good potential with future cards and synergies, which makes from him competitive Dwarf (however, his ability is absolutely non-sense and I don’t ever want to put him into a play at the expense of any Dwarf hero). For me, the weakest ally is Silverlode Archer, and I always search any substitution for him as soon as possible. 3 cost with 1-2-0-1 stats and only Ranged keyword are really dismal parameters. Guard of the Citadel doesn’t shine as well. He is very vanilla ally, who can offer us only little amount of everything, only his Gondor trait saves him in future from abandonment. Son of Arnor is better from weaker allies, though I don’t like his stats very much. Pulling some enemy toward you can be certainly useful ability… in specific decks. Longbeard Orc Slayer deals 1 damage to all Orc enemies, so in many heavy-Orc scenarios he can make nice havoc among group of enemies. But if you want to include him to a deck, it should be also with Sneak Attack. Finally, 1-cost Snowbourn Scout makes honor to Leadership sphere and he stays in your decks quite long. Faramir is true power among Leadership allies – boosting Willpower of each committed character to a quest (of one player) only for exhausting him belongs to super-ability, which can win you a game. I see Core Leadership allies as pretty expensive fellows considering their stats, which could be better or at least better distributed. I can’t rely on questing, attacking or heavy-defending of Leadership allies, because almost nobody (excluding Faramir) appears to be real and helpful contributor to any of these actions. You have to agree with “strength of mass” or mix your deck with any other sphere of influence, depending which action you want to prefer. When I list among Leadership events, unfortunately it reminds me the case of Leadership allies – we have got only few real useful events, which worth it. Rest of them works in theory or are very situational. I see that at Leadership events dominates one kind of effect – preparing characters. Ever Vigilant concentrates fully on allies, what I see as a necessary and logical step, if we have cards concentrating mainly on preparing heroes (Unexpected Courage, Common Cause). However, only several allies worth for preparing, primarily thanks to their useful actions (Faramir, Gléowine). In other cases, Ever Vigilant serves only in high emergency. Common Cause on the other hand helps heroes to prepare, however with additional cost of exhausting another hero. You need very specific composition of heroes in order to play this event well. In most cases, Common Cause won’t get a space in practice. And last event with preparing effect, Grim Resolve, is very expensive luxury, which, however, has very strong and helpful effect. But if you take care of resource generation, then one copy of Grim Resolve wouldn’t hurt your deck. For Gondor! isn’t bad event at all, but its time comes later – you must wait couple of expansions in order to extent true potential of this card. In other words, you have to wait for more characters with Gondor trait. Valiant Sacrifice is first Leadership event, which you can include without any doubts into your deck, where you know that you utilize it in every situation. Allies is just dying and drawing 2 cards for each killed ally is good exchange. Finally, ultimate Sneak Attack, component of powerful combo with Gandalf, is the best Core Leadership event and it will stay for a long time. Right timing of using Sneak Attack requires a bit practice, but calling ally with any default cost for only 1 resource is wonderful. I am honestly not very amazed by choice of Leadership events. I miss some simple card with resource-generation effect, many players would welcome such event. You must rely on arrival of Steward of Gondor or presence of Glóin. It’s shame that many cards from this section won’t show in your decks at all, because you won’t know, what to do with them. So you will remember only that Sneak Attack and maybe Valiant Sacrifice, the rest falls into hopeless grey. Leadership sphere can boast of only two attachments, but each of them has price of gold. Where allies and events leaves in us weird aftertaste, attachments will be filling us of measureless joy. Celebrían’s Stone will usefully help us with questing effort, because +2 Willpower for 2 cost is fair exchange (remember on Favor of the Lady). And that’s not enough – if Aragorn joins your adventure, he can utilize the secondary effect of this attachment and he gains a Spirit resource icon. So if you run multisphere deck, composed of Leadership and Spirit sphere, then Celebrían’s Stone is top attachment for Aragorn. But the most powerful attachment of Core set, maybe of all times, is called Steward of Gondor and generates you resources like on a conveyor belt. For this attachment you often decide to run Leadership sphere, because what could be better than play all cards without keep looking at cost? 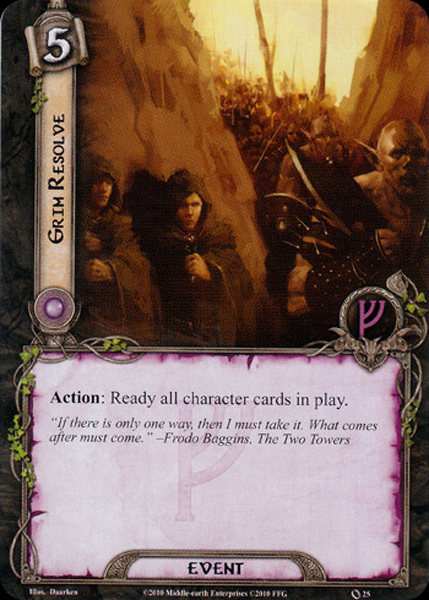 Resources are the most important commodity in LOTR LCG and you need to produce them in acceptable rate. Both attachments belong to Leadership top cards. They make your games far easier, drawing them in opening hand means a little victory for you and I have to confess, that my decisions about keeping your starting hand or making mulligan is influenced by presence of both cards (but Steward of Gondor more) to a great extent. Awesome job here! I insinuate that the Leadership sphere is missing some united concept, it may suffer the “crisis of identity.” I blame the designers for that the cost of allies doesn’t correspond with their true power and usefulness, everyone seems to be one resource more expensive than they should be. And some events I meet again only during writing these reviews, because I don’t use them at all because of their specific usage or just weak effect. We can find here some memorable jewels, that’s certain. But in summary, Core Leadership sphere looks somehow poor and unbalanced – we come to know epic cards and trash cards, but nothing between these two groups. I think that Leadership from Core set can serve as support sphere to another sphere, because standalone Leadership deck hasn’t good questing, attacking, neither defending – only heroes can save these actions by themselves. However, it’s only an opinion of one player – others could see in that ambiguity an advantage. Versatility and flexibility also belong to the main characteristics of the Leadership sphere. Hello. Congratulations for the post. Very interesting and fun. Can I translate and use in our platform ( susurrosdelbosqueviejo.com ) an LOTRLCG site in spanish?